Back to Basics: What is Interbody Fusion? Patients recommended for the eXtreme Lateral Interbody Fusion (XLIF®) procedure have probably had their surgeons talk about the fusion process. But what is interbody fusion? Back to Basics: What Are Common Back Pain Symptoms and Causes? Everyone’s back pain is different. It can be felt constantly or intermittently, and may present as a dull, sharp, piercing, or burning sensation. The XLIF (eXtreme Lateral Interbody Fusion) procedure is a minimally disruptive approach to traditional lumbar interbody fusion. Back to Basics: What is “spondylolisthesis”? Back to Basics: What is “stenosis”? Stenosis is the abnormal narrowing of the spinal canal or the opening between vertebrae through which nerve roots exit. The narrowing in spinal stenosis may be the result of aging, degenerative disc disease, disc herniation, scar formation, or a tumor. Back to Basics: What are “degenerative disc disease” and “disc herniation”? 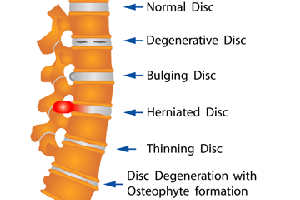 Degenerative disc disease (sometimes called DDD) is defined simply as wear and tear on the intervertebral disc, which may occur due to normal aging or longstanding trauma. The condition is caused by small tears in the disc annulus and loss of water content. What are the three main regions of the spine? How many vertebrae make up each region? What’s a disc? Where are your spinal cord and nerve roots located? Brush up on your spine anatomy basics.